As you guys probably know, my wedding is coming up soon! I’m getting married in Dalhousie Castle in Scotland in mid-October, and I’m so excited! But there’s so much wedding prep to do, not the least of which includes aesthetic stuff. Of course not every bride NEEDS to do these things, but I’m a beauty fanatic, so OF COURSE I’m gonna do them! And my fiancé, Gregg, is also looking into teeth whitening, skin treatments, etc, so guys can do this too! 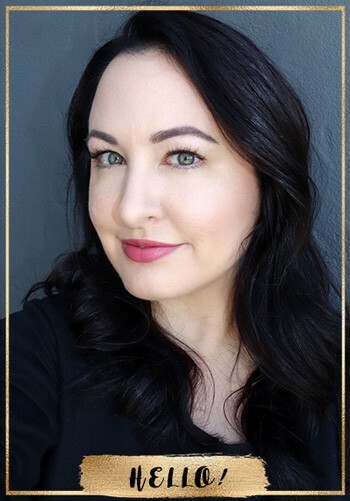 I’ll be honest – I put off finding a wedding dress until a few weeks ago – about three months before the wedding, because despite a pretty strict diet and moderate exercise plan started in January, I haven’t been able to lose as much weight as I wanted. I’m not trying to be a skinny minnie – just trying to get down to a size I’m comfortable with. Not to downplay the 18 or so pounds I’ve lost, but in 7+ months, I thought I’d be able to lose more. I’ve since learned that my hormones are out of whack, which explains a lot, but it will take a while to fix them. 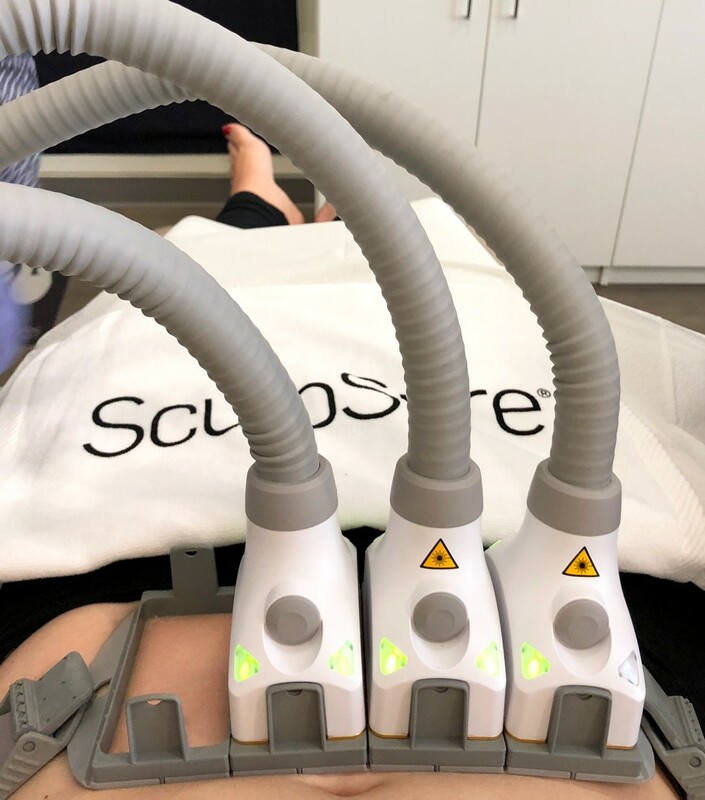 I have little (and some large) pockets of fat that bug me, and I had heard that SculpSure body contouring was potentially a way to lose some inches. You may have heard of CoolSculpting (which I tried a while back)? Well, SculpSure body contouring is a newer form of technology that uses a non-invasive laser to contour the body. 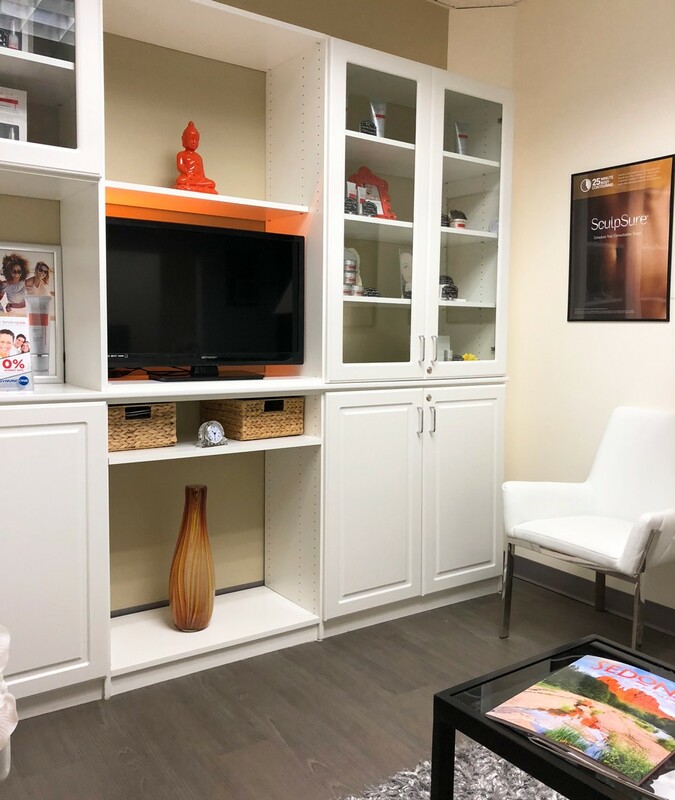 I talked to the lovely Sandra at LaserXX, a med spa on Wilshire Blvd in Los Angeles, and she told me that SculpSure body contouring uses heat (light waves with a 1060 nm wavelength if you want specifics) instead of cold to induce lipolysis. Basically it kills your fat cells. Dr. Peiman Berdjis, told me it actually ruptures the fat cells, and they are then removed from your body via the lymphatic system over the span of 2-3 months. You have a set amount of fat cells by the time you’re two years old, and they can only get bigger or shrink with diet and exercise. Dr. Berdjis says you can’t grow new ones but SculpSure removes them, so you have fewer in the area you’re treating. This sounded like a great alternative to liposuction, which is VERY expensive, and requires anesthesia and lots of down time. I ain’t got time for that! My wedding is now in 2 1/2 months, so even though I’ve already bought my dress, it can always be tailored, so I’m hoping to lose an inch or so by the time the wedding rolls around. 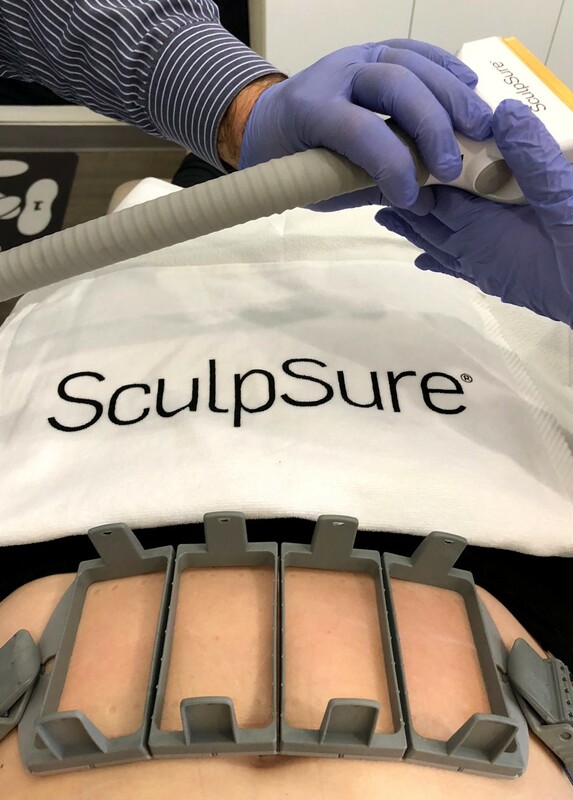 SculpSure body contouring is supposed to remove up to 24% of fat cells in the treated areas. 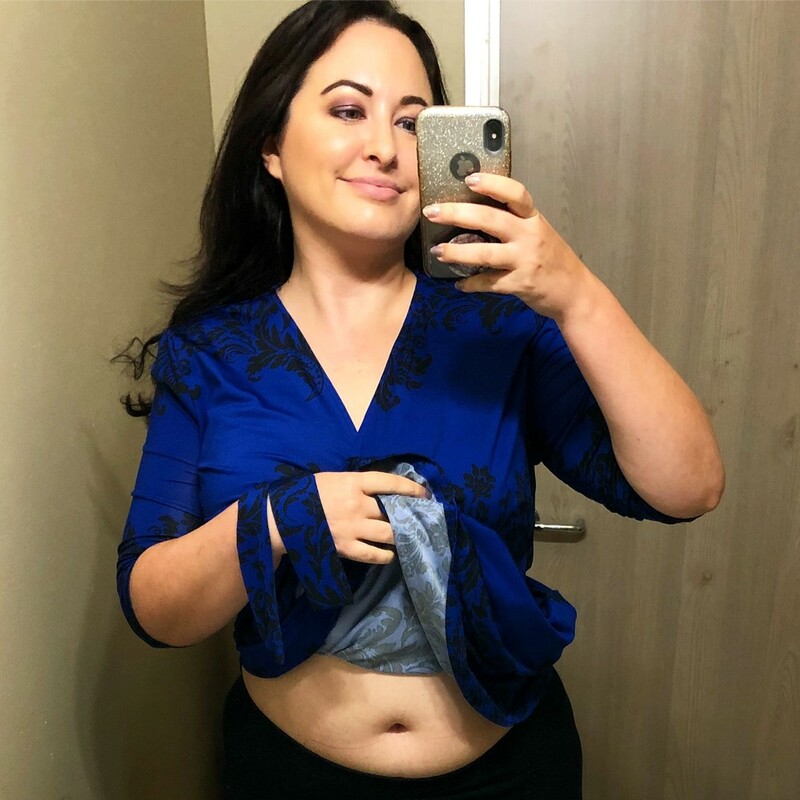 I went in with fairly low expectations – I’d like to see a reduction in the part of my tummy that bothers me, but I’m not expecting to lose a dress size or anything like that. If the results are better than that, or if I actually lose weight (as some have reported), I’ll be a very happy camper (…er bride)! So, if you missed seeing the procedure in my Instagram and Facebook stories, let me give you a rundown. Basically I came in, filled out some forms, and then Sandra took lots of photos of the area (typical med spa stuff so far!). Everyone was so nice! Then, I had a consultation with Dr. Berdjis, and they let me know that my BMI was okay for this treatment (it has to be 30 or less). Sandra and team fitted me with the brackets. Each bracket fits one of the four probes – you can use one or all of them for one treatment area, depending how big the area is and how much fat you have to treat (I have plenty!). 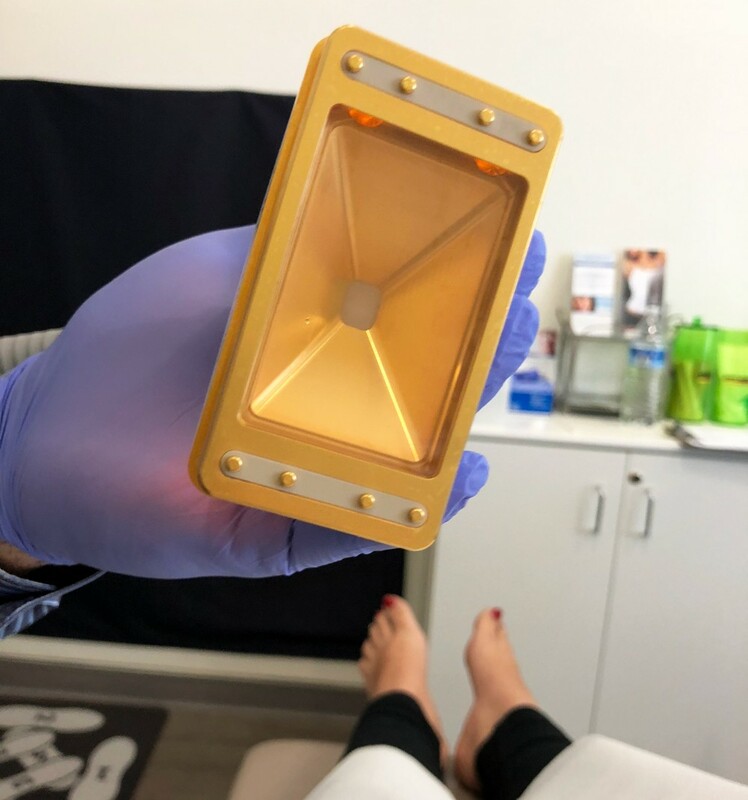 The laser treats about an inch more than the area of the brackets, so the treatment area is a little bigger than it looks. 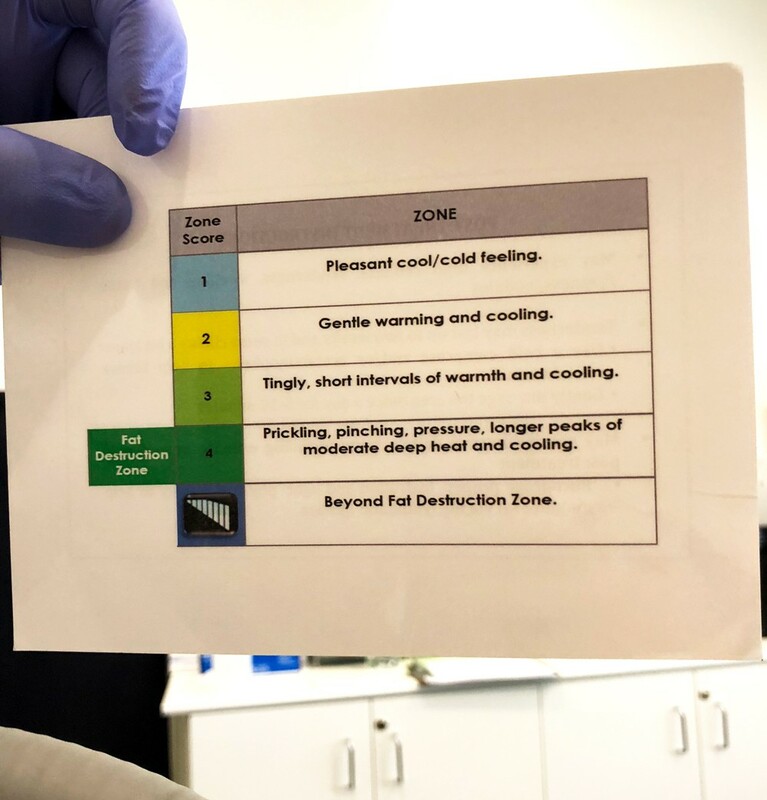 Once the machine is started, it cycles through four “zones” – you feel cool, then a little warmer, then hot, and then hot with some pinching and pressure (to me it felt just like period cramps). I am VERY, VERY sensitive to pain (and I went during PMS week, so my pain tolerance was even lower – don’t do that if you can help it), so I had the doctor turn it down a little bit. He turned it back up toward the end to get the best result possible, and by that time I had grown used to the feeling. He said if you have more fat, you’re likely to feel more pain than someone who has less fat. I’m not going to lie – it’s not comfortable, but it does cycle through, so you only feel the max heat for several seconds and then the cooling sensation comes back. In reality, the cooling feature is on the whole time, but the laser cycles on and off for the duration of the treatment (25 minutes total). This is how my skin looked after the probes were removed – cool to the touch. Photo taken immediately after the first treatment – a little swollen but not bad! For after-care, they told me to drink lots of water (at least 6-8 glasses per day), massage the area lightly for 5-10 minutes twice a day, and to do cardio to keep the lymph system moving. I need to keep that up for the entire 2-3 months, to get the best result. They also told me not to take anti-inflammatory NSAIDs (like aspirin, Motril or Advil) because reducing inflammation will reduce how well the treatment works. So, for the next few months, I’m going to try to avoid painkillers, or just use Tylenol when necessary. But, with my migraines and muscle pains, I doubt I’ll be able to stay off Advil completely. So, this morning (the day after my treatment), I realized I had already lost a pound and a half! Not everyone loses weight (and it’s not meant to do that, but from what I’ve heard – but it does happen). Most people lose inches – not pounds. I wouldn’t necessarily chalk that up to anything more than daily fluctuations, EXCEPT it’s a pound and a half I had not been able to lose in months. The scale would never go below that number until now, so I think that’s a great sign! So that’s how it went down! I’ll report back after a few months to let you know my results! Pricing is about $400 for each bracket (or $1600 for all four). It’s not a cheap procedure, but it’s A LOT cheaper and safer than liposuction! 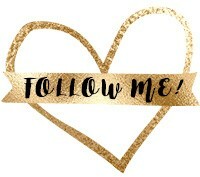 LaserXX often runs specials – so make sure to follow them on Instagram and Facebook! Stop by and tell them Jen said hi! « Are Nutritional Supplements a Scam? Very interesting. I look forward to hear what your thoughts are a few months from now. Can’t wait to see your results after a few months. Looking forward to results, but more importantly, I’m getting soooo excited for your wedding day! You’ll have to share lots of photos! I am really curious about this, so I’m very interested in seeing more in a couple months! How do you think this compares with the CoolSculpting you had done? have enough fat. wish she had said that b4 and saved me the money. 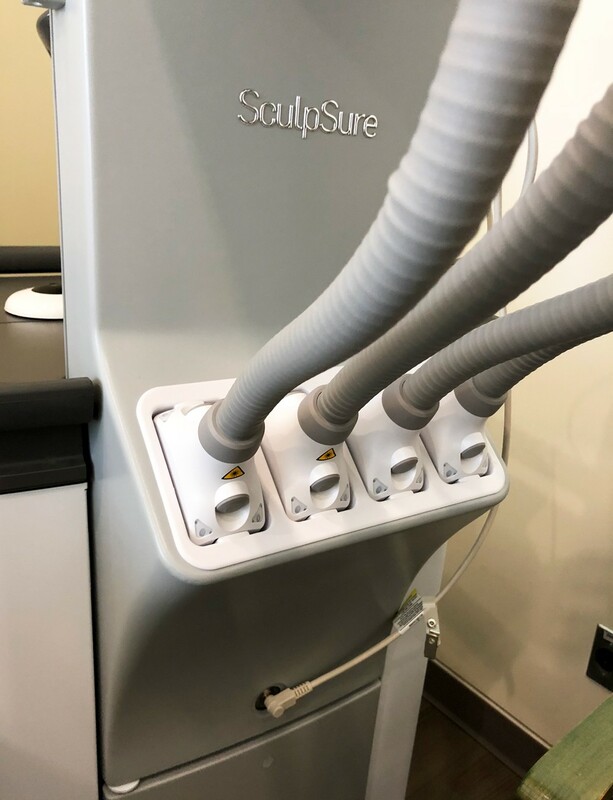 I have been to several seminars on sculpsure. I am not sure about it. I know groupon in my area has a deal 458/4 brackets. I am thinking abt it but still on the fence. Thanks Nancy – and yes I will probably OVER-share hahahaha! Wow that is terrible that they took your money like that! I won’t be able to compare results with CoolSculpting for a few months, but I didn’t really notice much of anything from the Coolsculpting. I had it done once on my thighs and once on my tummy. They say you need 2-3 treatments in the same area, and I didn’t do that, so it’s not a great test unfortunately. That’s interesting! I’ll be curious to know what results you get after 2-3 months. I’m afraid of needles so no way I would do a liposuction, but I could do something like that. Can you do it on the legs? I’m so glad to see you doing this because I want to try it! Yep! You can do it almost anywhere you can pinch fat – typical areas are thighs, abdomen, and flank. 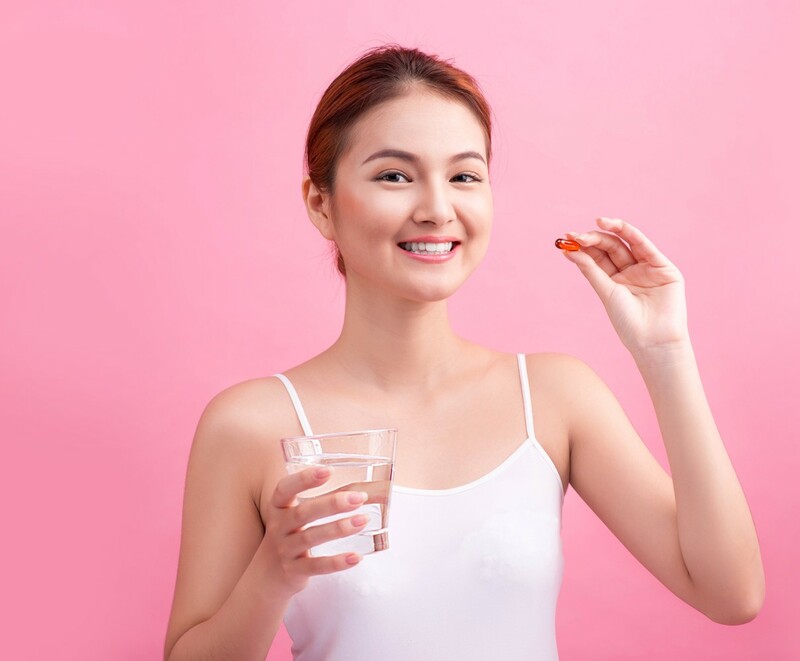 Are Nutritional Supplements a Scam?